My CEA is down again (from 9 down to 7.6). This is a hopeful sign that these treatments are working as designed. I’m scheduled for the MRI and CT follow-up Scans for next Thursday, 3/21. The hope is that these scans will show the cancer on the decline, positioning me for a future surgery. The other good news is that the Erbitux Rash has continued to decline. I did not experience much (if any) resurgence with the last treatment. And therefore today I am receiving more Erbitux along with the Fulfiri chemo. I want to write more of an update but I’m struggling with being very tired right now and the words are simply not complete at this time. I’ll include an additional update in a day or two and will conclude this update with the following invitation. The Colon and Rectal Center in Battle Creek Michigan are sponsoring a 5K Walk/Race. I’d like to invite you all to join me in this activity. Maybe we can plan lunch together afterwards.. The event is on Saturday June 1st at 9am. Please let me now if you are interested in joining me in this race/walk. Thank you Colette and Darrick for suggesting this activity; I’m already looking forward to a beautiful day on 6/1. More information and sign-up can be found on the following link. Great news! I’d love to walk with you in 6/1!! I’m looking forward to seeing you this weekend. The walk sounds good, it’s on John David’s Birthday; maybe we can get him walking too — he could really use it!!! 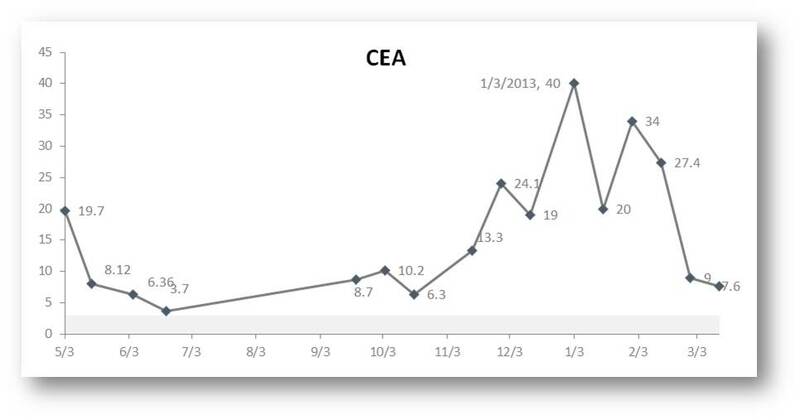 I’m thrilled to hear about the CEA levels being down again. It makes me excited to get the next report of them down yet again!!! Phil: I rejoice with you in this good news! I’ve been praying for you daily. That is good news Phil! Yeah! Our family would love to walk with you all on the 1st, but we have a baseball tournament that day in Potterville. Sounds like a good weekend for the team to bring you another trophy!